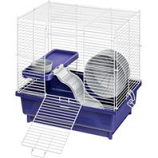 Perfect starter cage for rabbit ferret or guinea pig snaps together in minutes no tools required. Deep plastic base prevents bedding from scattering while the white wier top makes for easy viewing and ventilation. Home measures 48x24. . .